The search results shown on the Browse page will update automatically. When you want to delete a tag from your current set of search options, click the “x” to the right of the tag. Again, the search results will update automatically. 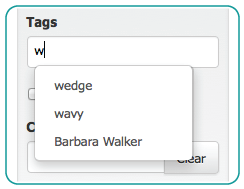 For your tagging convenience, this “Tags” box appears on the Contribute page too, and on the Edit page for each stitch pattern.